On a nondescript Tuesday afternoon, I excitedly make my way to Jomo Kenyatta International Airport. I sit impatiently at the back of the taxi, watching the cars around me to stop me from gazing at my watch for the umpteenth time. I am meeting two of my girlfriends at the airport. We are going to Mauritius! I try to contain myself from doing an impromptu jig at the back of the car, lest the taxi driver think that I am hopping mad. I have only ever seen Mauritius in postcards and on those documentaries that show the pristine beaches around the world. Once at the airport, we hug animatedly as we meet at the airline check in counter. This is my first “girls only” trip since I got married very many moons ago. I cannot wait to explore the capital Port Louis. What is interesting about Mauritius is that it is possibly the only country in Africa where French and English are both spoken. I have no intention of speaking English during my stay there. I hope my now rusty French will come back to me once the plane touches down on the other side. I intend to be très French for my entire stay there. Mauritius has an interesting history. It is said that its earliest inhabitants were Arabs in the middle ages, and that the island was hitherto uninhabited. The Dutch and later the French came a-calling in the 17th and 18th centuries. The British landed there in the 19th century. They went into war with the French in what was the naval battle of the Grand Port. Even though the French won, the Britons forced them to surrender the island in December 1810. However, they (the French) were allowed to keep their land, the French language and the French laws. Under the British rule, Mauritius was the main sugar producer for the British Empire. Sugarcane continues to be a major cash crop in this tiny island. By the way, Mauritius has about 1.2 million inhabitants. The total area of the island is roughly 204,000Ha. Of this, sugarcane is cultivated on 72,000 Ha, which represents roughly 85% of the arable land of the country. From this, an average of 600,000 tons is produced annually, most of which is exported to the European Union. The flight itself is uneventful. I am never able to sleep on daytime flights and so I try to busy myself with a book because I don’t like to listen to the drone of airplane engines. My girlfriends and I are seated at different places but I bump into one of them on the aisle when I get up to stretch my legs. It’s a good precaution to take when travelling. We go the end of the plane, from where they store the food, and collapse into giggles like school girls. It’s only a flight I know, but I haven’t heard this much fun, since I was, well, a school girl. The irritated sidelong glances of the stewardess make us reluctantly walk back to our seats. 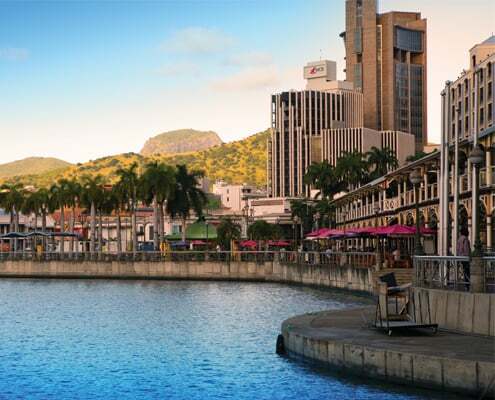 I don’t know about the rest of Mauritius but the heart of Port Louis, which is where one would say is the central business district, is very mountainous. I believe that it is the only country in the world whose capital is surrounded by mountains. It is quite a sight to behold. For this reason, the airport quite a distance from the city itself, say, unlike Jomo Kenyatta Airport that is a 20 minute drive from the city centre, if one does not encounter any traffic. Our hotel is less than 10 minutes away from the airport. We settle in early for the night so that we are bright and early for adventure the next day. Shopping is the first item on the agenda. Not the high street shopping as it were, but buying little crafts and knickknacks for quaint tourist shops. We drive to a charming quartier of Saint Louis. The architecture is delightful. It has a south of France feel to it. The influence of French architecture is apparent from the window lattices, the doors to the grander designs of the buildings. My friends bargain for deals in English, whilst I am still determined to pull an air of je ne sais quoi. After a few false starts in what is left of my French, I give up and switch to English, thank you very much. The next day, I leave my friends in the hotel; one of the things that I like most to do is see the sights and sounds of a new place by myself. For this, I take a taxi and ask the driver to take me to the heart of the central business district, which is about 45 kilometres away. He advises me against going into town, so to speak, for fear of getting caught in traffic. Visions of the nightmarish traffic of Nairobi cross my mind and I am quick to acquiesce. As I wrote earlier, the heart of the capital is surrounded by mountains. Known as the moka range, it forms a semi-circle around the capital. It is for this reason that the airport is situated on the opposite end of Port Louis. The weather is pleasant and the streets are spotless. There is not a sign of any littering; its cleanliness reminds me of Kigali. I see many French brands, for clothing, automobiles and so on. Having said that it is also worth noting that Mauritius has a robust economy. With firm fiscal and legal policies in place, it creates a conducive environment for commerce and industry. Furthermore, transparent investment policies makes for a safe bet for foreign investments. I get back to the hotel, ready to meet my friends later in the afternoon on the beach. It is my last day as I have an early morning flight. We have the time of our lives. We don’t swim too far from the shores. The beach that we are on is rather rocky, so one has to be careful when swimming. It is a delightful afternoon no less, filled with mirth, laughter and joy. We seem to be having so much fun, a tourist asks if she could take a photo of us. It is only later that at the hotel we reflect on the fact that we have entrusted a total stranger to taking a photo of us; we don’t ask her to send it to us, neither do we ask what she intends to do with it. We have dinner later that evening and stay up late because this is our last night together. My friends leave on Saturday and Sunday respectively. I smile inwardly all the way to the drive to the airport the following morning. That’s got to be the shortest yet most varied sojourn I have had in a very long time. Mauritius, I will be back. This article was first published for our February-March 2018 issue of our online publication Prose. Read the issue here.